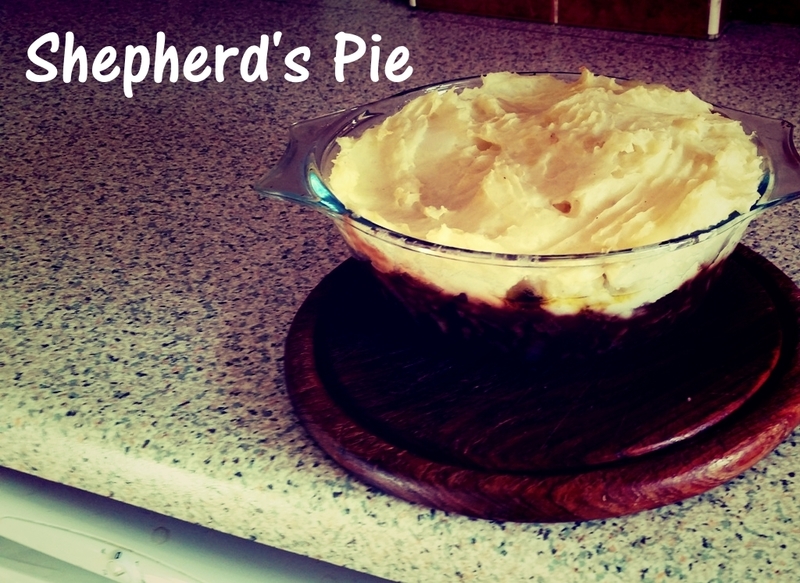 It wasn’t planned this way but keeping up with the six nations theme mentioned in my Comforting Classics Shepherd’s Pie recipe this review could be dedicated to the Italian Rugby team and indeed the guy with one of the coolest names in rugby Martin Castrogiovanni. 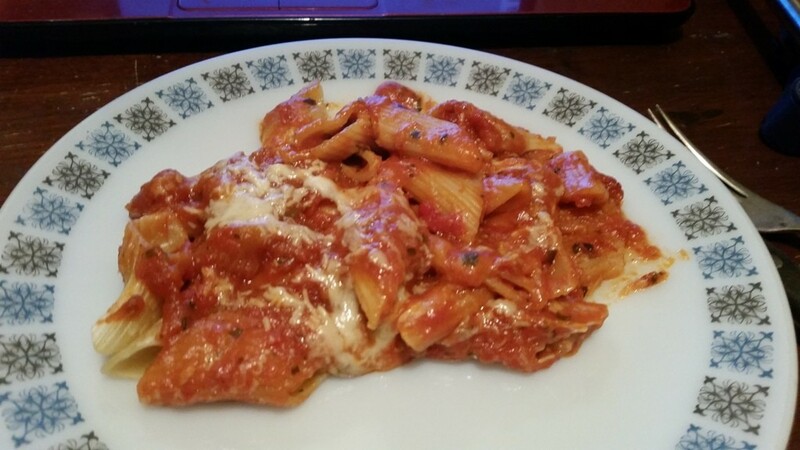 Penne pasta in a tomato sauce topped with mature cheddar cheese and mozzarella cheese. I had my concerns though, you know what I’m like about choking, and my teeth are useless so I didn’t know if I’d cope with stringy mozzarella (I’m 50 shades of falling apart I know) but I thought I’d give it a go. 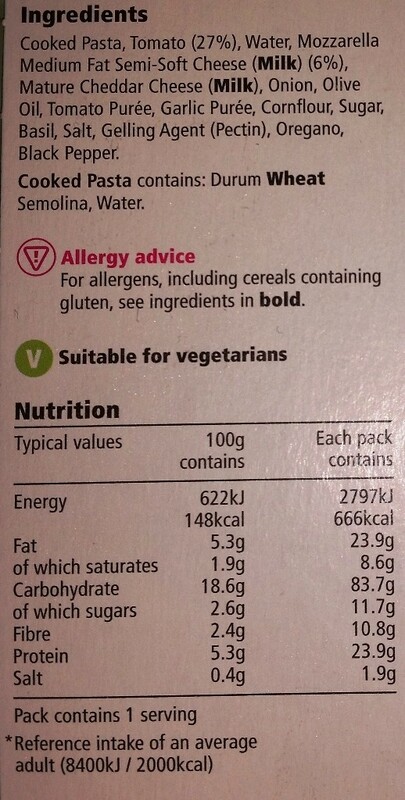 As you can see the cooking instructions are fairly straight forward and include oven cooking which is ideal for someone who hasn’t got a microwave…. wait was that just a stupid thing to say…. I think so!! As you know my microwave is 700W so I cooked it for 6 minutes, I’m not sure if that was what Tesco would recommend but it worked for me. Above are the ingredients and the nutritional information, this dish wash enjoyable. It didn’t set my world alight but it was comforting, tomatoey and cheesy, I had to add salt and pepper because there wasn’t enough for my personal taste. The pasta wasn’t too chewy, which is always a bonus in my eyes. Two negatives really, the first was the cheese it tasted fine but I didn’t really see the purpose of the two cheeses, I don’t think the combination of the two added anything to the dish. My other observation, and probably the biggest is that it was all a bit claggy, it all stuck together in a lump as opposed to be a saucy pasta dish. 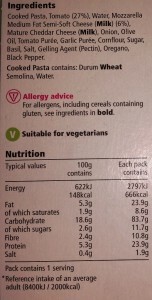 You may be able to notice from then picture above that it was quite congealed, I noticed when writing this review that there was Pectin included in it. Pectin is a natural gelling agent which can be found in many different fruits and vegetables such as citrus fruits. The word Pectin comes from the greek word for congealed or curdled, It is often used in jams and jellies to help them set, I cannot see why it was used here and I think the consistency of this dish was the only downfall. 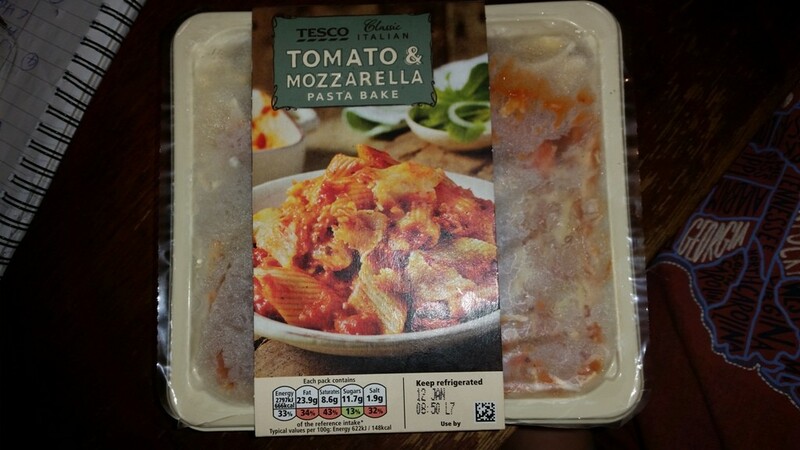 I’ve given this a strong six out of ten, I’d eat it again if it was in the freezer and I can say I did enjoy it but it wasn’t my favourite. I don’t think I’d overly rush back to buy it again. 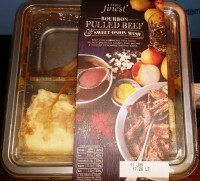 As things stand I’ll be reviewing another ready meal next Tuesday but who knows…. that may change, if you’ve got a better idea let me know! Before then I’ll be posting my “Stunning Spiced Sausage Stew”, honestly I can guarantee that with valentine’s day coming around the corner, that recipe will be one to have in your back pocket.